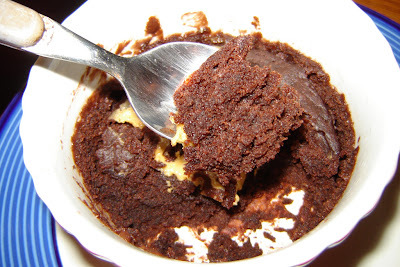 It is possible to make cakes in a microwave. Up until a few days ago, I did not know this. Now I do, I had to try. I wanted to try a recipe that doesn't require any eggs because I never use the things for anything else. After reading several, I plumped for this one due to the portion size looking reasonable. Here are the ingredients I used. As an Absolute Beginner, I decided to use self-raising flour rather than fluffing about with baking powder. I used xylitol rather than sugar because that's what I happened to have in the house, and I like the tooth-friendliness of it. I have never bought flour before. I mixed the ingredients in a ramekin. 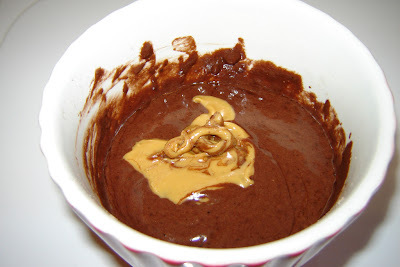 It made a nice thick batter. The portion size was indeed just right. 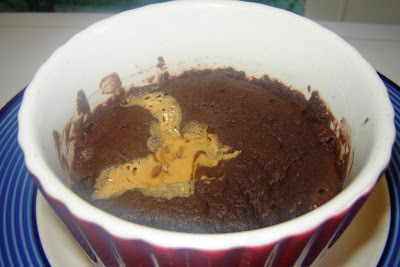 A lot of microwave cake recipes specify double the quantities of the ingredients; that would have been far too much. 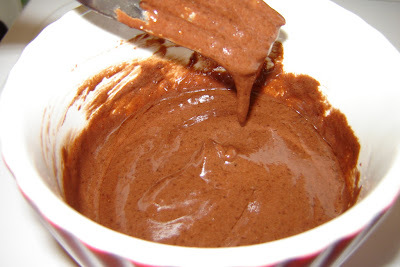 It wasn't sweet enough; there was lots of cocoa flavour, but not enough sweetness to balance it. Next time, I will add an extra teaspoon of xylitol. There was a definite saltiness; one (small!) shake of salt is apparently too much. Although the consistency looked fine, it tasted dry; the mouthfeel wasn't quite right. The lack of sweetness probably had something to do with this. Could've been slightly overcooked; next time, I will reduce the cooking time by ten seconds. The nice cup of tea I drank with the cake did offset this somewhat. I'm not sure about the peanut butter; if anything, it contributed to the dryness. I do like peanut butter, but in concert with something moist and sweet (e.g. banana). I will reevaluate after correcting the moistness and sweetness of the rest of the cake. Lots of potential, though. Roll on tomorrow's afternoon tea! And we're half-way through the half-season already!